Spire.XLS for .NET is a professional Excel .NET component that can be linked into any type of .NET 2.0, 3.5 or 4.0 project, either ASP.NET web sites or Windows Forms application. Spire.XLS for .NET offers a combination of APIs and GUI controls for speeding up Excel programming in .NET platform-create new Excel documents from scratch, edit existing Excel documents and convert Excel files. This Professional .NET Excel component is a standalone Excel .NET managed assembly and does not depend on Microsoft Office Excel. Spire.XLS for .NET offers support both for the old Excel 97-2003 format (.xls) and for the new Excel 2007 and Excel 2010 (.xlsx) format. It features fast and reliable compared to developing your own spreadsheet manipulation solution or using Microsoft Automation. Spire.XLS for .NET enjoys good reputation in either enterprise or individual customers. These customer types include Banks, Data processing houses, Educational institutions, Government organizations, Insurance firms, Legal institutions, Postal/cargo services and etc. 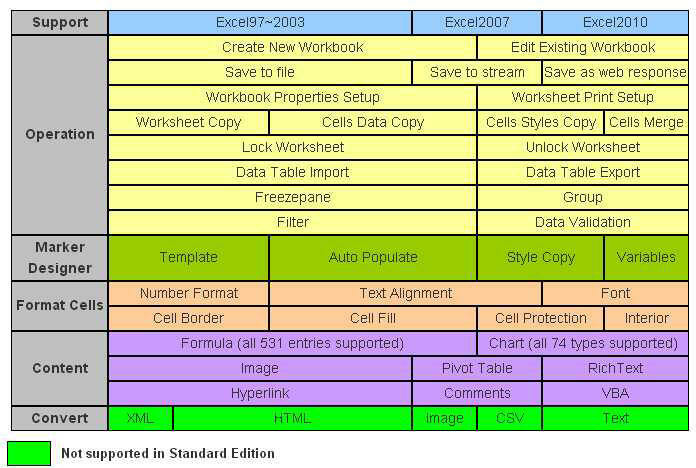 The Difference between Standard and Pro Edition lies in the feature of File Conversion: Pro Edition supports converting files from Excel to PDF, HTML, Excel to CSV, Excel to Text, Excel to Image and Excel to XML(the Excel can be either .xls or .xlsx); while the Standard edition doesn't support. Spire.XLS for .NET enables developers/programmers to build ASP.NET, Web Services, WinForms or any other type of application for any .NET Framework version from 2.0 to 4.0. Full support for 32-bit and 64-bit system. Spire.XLS for .NET has powerful conversion ability and it enables converting Excel files to most common and popular formats. Import/Export data from a DataTable, DataView, Array, DataGrid etc. Spire.XLS for .NET provides detailed programmatic access to formatting properties of all spreadsheet elements. Set all types of Text Alignment settings. Apply different Colors to Cells, Fonts, Gridlines, Graphic objects etc. Apply different Rich Text formatting in a single cell. Apply gradient Background Patterns on cells. Spire.XLS for .NET enables developers/programmers to set PageSetup options. Adjust your page orientation, scaling, paper size. Specify your margins and page centering. Create or edit your header and/or footer with image.